Real quick question: how do you increase productivity at work? The greatest (highest paid) minds would just say: do agile or scrum or something. What’s scrum? That’s where you gather ’round every morning for a waste of time meeting that kills your every desire to be productive. A while back, [Travis Goodspeed] was stuck in some lesser circle of hell like this and in an effort to be polite by not looking at his phone too much, looked at his watch too much. This led to the creation of the Goodwatch, a new bit of hardware that replaces the guts of a Casio calculator watch with a hex editor, ISM-band radio, MSP430 disassembler, and of course an RPN calculator. [Travis] has already introduced the GoodWatch to the world. We took a look back in December but haven’t heard anything since. His talk at Shmoocon 2018 put a little more light on how this project came to be. Hey, did you know Hackaday is starting an Open Access, peer-reviewed journal? The Hackaday Journal of What You Don’t Know (HJWYDK) is looking for submissions detailing the tools, techniques, and skills that we don’t know, but should. Want to teach everyone how to make sand think? Write a paper and tell us about it! Send in your submissions here. Have you noticed OSH Park updated their website? The MSP430 line of microcontrollers are super cool, low power, and cheap. Occasionally, TI pumps out a few MSP430 dev boards and sells them for the rock-bottom price of $4.30. Here ya go, fam. This one is loaded up with the MSP430FR2433. Noisebridge, the San Francisco hackerspace and one of the first hackerspaces in the US, is now looking for a new place. Why, you may ask? Because San Francisco real estate. The current price per square foot is triple what their current lease provides. While we hope Noisebridge will find a new home, we’re really looking forward to the hipster restaurant that’s only open for brunch that will take its place. The coolest soundcards, filled with DOS blips and bloops, were based on the OPL2 and OPL3 sound chips. If you want one of these things, you’re probably going to be digging up an old ISA SoundBlaster soundcard. The OPL2LPT is the classic sound card for computers that don’t have an easily-accessible ISA bus, like those cool vintage laptops. The 8-Bit Guy recently took a look at this at this neat piece of hardware, and apart from requiring a driver to work with any OPL2-compatible game, this thing actually works. NVIDIA just did something amazing. They created a piece of hardware that everyone wants but isn’t used to turn electricity into heat and Bitcoin. This fantastic device, that is completely original and not at all derivative, is sold in the NVIDIA company store for under five dollars. Actually, the green logo silk/art on this PCB ruler is kinda cool, and I’d like to know how they did that. Also, and completely unrelated: does anyone want ten pounds of Digikey PCB rulers? A lot of things tend to get stretched during the holiday season, like shopping budgets and waistbands and patience. This year, [Chris] is stretching the limits of both the mini breadboard and the humble 1.5 V LR44 coin cell with his joule thief-driven LED mini Christmas tree. With the push of a micro momentary, the joule thief circuit squeezes enough power from an LR44 to boot an MSP430 microcontroller, which needs 1.8 V – 3.6 V. After boot, the micro takes control of the joule thief circuit and milks it whenever the voltage falls below 3.2 V. This tree may be small in stature, but it’s feature-rich. A push of the same momentary button cycles through four different light shows, ending with a medley of all four. Be dazzled after the break. The code for this tiny tree, which features an awesome ASCII breadboard layout and schematic, is up on GitHub. [Chris] has it listed among a few other manageable bare-metal ‘430 projects that would be great for beginners at pure C. If that sounds like you, why not give yourself the gift of learning a new language? We’ve seen some spirited ways of lighting LEDs, but doing it with candle power takes the fruitcake. A popular purchase from the usual stockists of imported electronic modules is a digital panel meter. A very small amount of money secures a module with a seven-segment display that you can stick on the front of your power supply or project for an easy readout. Even before the advent of these ultra-cheap Chinese products there have been readily available digital meters, in a line stretching back to the 1970s with chips such as the Intersil 7106. [Marcus Taciuc] is eschewing the off-the-shelf parts, and creating his own digital panel meter. He’s using an MSP430 microprocessor as the brain of his device, and a Hitachi HD44780 compatible LCD display at the front end. The appropriate combinations of resistors and op-amps feeding the MSP’s ADC inputs allow his meter to be used to measure up to 40 VDV, and up to 10A. He’s put up a video which we’ve included below the break, showing the use to which this meter has been put: replacing the moving-coil meter in what looks like a classic piece of Heathkit equipment. A 3D printed bracket allows the new meter to fit the circular hole of the original meter, with the LCD on the front. You might still order a prefab meter module, but you can’t deny this looks good. Finding the right wall wart or charger to go with an appliance might be a matter of convenience to you and I, but there are some people who really, really need the right charger, because not having it could mean a fire. [marius] is a Romanian hardware engineer who moved to Papua New Guinea, where he had the opportunity to travel in the remote jungle of that country. There, he saw many people who used solar panels to charge car batteries for a 3W light bulb at night, their phones, or other conveniences that only need a few Watt-hours a day. Connecting car batteries directly to solar panels isn’t a smart idea, so [marius] set out to create a simple, very low-cost DC-DC voltage converter. He’s calling it the Scorpion 3.0, and it looks like a fantastic tool for low-income areas that are far off the grid. The design of the Scorpion consists of a 3D printed enclosure, with one forked end containing some alligator clip leads, and a standard barrel jack on the other. In the middle is a character display showing the input and output voltage, and a simple rotary encoder for user interaction. 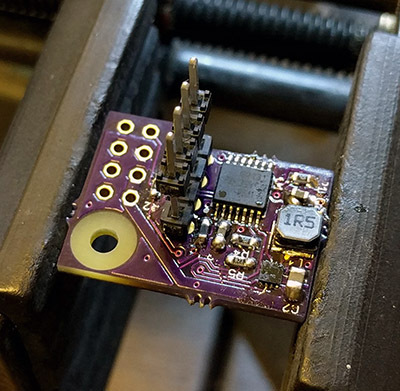 The circuit for the Scorpion 3.0 consists mostly of a cheap, low-power MSP430 microcontroller managing the display, encoder, and a buck converter. Designing something for off-the-grid usage means a few engineering challenges, and being in Paupa New Guinea, there are a few environmental considerations as well. [marius] is varnishing his 3D prints. No, it’s not going to be IP68 rated, but it helps. Making the Scorpion cheap is also a big consideration, most probably resulting in the choice of the MSP430. It’s a great project, and an excellent entry to the Hackaday Prize. You can check out the demo video of the Scorpion below. No, that watch isn’t broken. In fact, it’s better. [Lukas] got so used to his binary-readout ez430 Chronos watch that when the strap disintegrated he had to build his own to replace it. But most DIY wristwatches are so clunky. [Lukas] wanted something refined, something small, and something timeless. So he shoe-horned some modern components, including an MSP430, into a Casio F-91W watch. Anyway, back to an epic and pointless hack. Have a look at the tiny, tiny board that [Lukas] made. Marvel in the fact that he drove the original LCD screen. Dig the custom Kicad parts that match the watch’s originals. To get an accurate fit for the case, [Lukas] desoldered the piezo buzzer contact and put the board onto a scanner, which is a great trick when you need to get accurate dimensions. It’s all there, and well-documented, in his GitHub, linked above. All in all, it’s an insane hack, but we love the aesthetics of the result. And besides, sometimes the hacking is its own reward. You can go to any dollar store, gas station, big box store, or your favorite Internet retailer and get a USB power bank. It’s a lithium battery mashed into a plastic enclosure with a USB port, probably poorly engineered, but it does serve as a great power supply for the Raspberry Pi. For the Raspberry Pi Zero contest we’re running over on hackaday.io, [Patrick] built a lithium phosphate battery pack that’s much better engineered and has some features a simple USB power bank will never have. [Patrick]’s Raspberry Pi UPS isn’t just a battery and charge controller attached to the power rails; this board has a microcontroller that has full control over when the Pi wakes up, when the Pi goes to sleep, and can put the Pi into a clean shutdown, even in headless mode. SD cards around the world rejoiced. The electronics for this project are just a low-power MSP430 microcontroller and a boost regulator. The battery pack/power manager attaches to the Pi through the first few GPIO pins on the Pi’s 40-pin header. That’s enough to tap into the 3.3 and 5V supplies, along with the serial console so power events can be scripted on the Pi. So far, [Patrick] has made a few time-lapse movies with his lithium battery backup, a Pi Model A+, and a Raspberry Pi camera. He managed to take 99 pictures over the course of about 24 hours, powered only by a single lithium-ion cell. You can check that video out below.